Thailand is the source of some of my favorite food. A nephew is teaching English in Thailand right now. I have actually seen three or four Thai movies, but didn't see them as a major film producer. 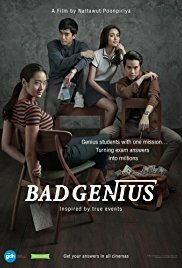 Skimming through what Netflix has to offer I noticed "Bad Genius." It seemed quirky, but I was struck with the idea for widening my foreign movies comfort level. It won the audience award at the Toronto Reel International Film Festival; best newcomer at the Asian Film Festival and at the Thailand National Film Association best picture, best director, best actor, best actress and best supporting actor. Part of the movie is like a heist movie with lots of twists and clever reactions, but part is also a morality play. Instead of stealing valuable objects it is about stealing valuable information. A very smart girl, Lynn is transferred to an elite high school in Bangkok with help from her widower father making some sacrifices and she making some shrewd negotiating points. There she befriends (or is befriended by) a relatively wealthy girl, Grace and her wealthier boyfriend, Pat. The viewer will be impressed with what a clever scheme is planned. But first Lynn was induced to help her friend and her boyfriend cheat on scholastic tests. Part of the cover was to give music lessons to an increasing number of customers. We are introduced to a rival, a boy named Bank who comes from an even poorer family who is a loner and very honest. His intelligence is equal to hers, but not only does he rebuff efforts to cheat he is able to uncover her scheme to the authorities. She gets reprimanded and not allowed to compete for a scholarship she obviously was well qualified for. Bank is manipulated into participating, but when Lynn finds out how he was set up she wants to back out. Although Bank is upset he decides maybe it is in his best interest. The network of wealthy students organizes and fund a trip to Australia for the two while Lynn and Bank work out some details. Security is tightened as the Australian test givers realize that cheating has stepped up. You can feel the pressure as the two try to circumvent new scrutiny. Bank actually gets caught (after sending coded answers to Thailand) and it looks like the authorities are suspicious of Lynn who feigns illness and takes off through the Sydney subway system with one man in pursuit. She manages to convince the testers that she left early because of an illness, but that meant her own test scores won't count, even though she finished the test. Using email and sophisticated tools the answers are sent to Thailand just in time for the wealthy students.to take their test. Now that is quite a lot of details (of course many have been left out), but you'll have to see the movie (available on Netflix) to find out how it ends. You are highly unlikely to guess much of the ending, but you will enjoy how they execute the overall presentation. Nattawut Poonpiriya, director and one of four writers had done a few previous films with some of the same crew. Cinematography by Phaklao Jiraungkoonkun was another strength of the movie. It was filmed in both Bangkok and Sydney. Music was effectively used to make you feel the tension by Vichiya Vatanasapt. Editing (important in the simultaneous action in Thailand and Australia was handled capably by Chonlaset Upanigkit. At IMDB they showed a pop music video which I liked enough to buy the audio, but didn't appear in the Netflix version. The star of the show was Chutimon Chuenscharooenskying who played Lynn displaying a range of emotions. She was a model and only recently got into acting. Because they wanted to project her as a genius the script made her left handed, but in reality Chutimon was right handed and had to adjust She won best actress award with the Thailand National Film Association. At the New York Asian Film Festival she was awarded Screen International Rising Star. The other genius, Bank was played by Chanon Santinatumkul. He had a few more films under his belt and won the Thailand National Film Association best actor award. Viewers could feel a romance coming on, but that was not the director's aim. The two developed a chemistry that spurred viewer's hopes. All the actors left a feeling of reality, but I would like to give some attention to Thaneth Warakulnukroh who played the father of Lynn. He stuck with her although you could feel his pain. He was the lead character in "Pop Aye" which was shown at the Hamilton Film Festival. In it he played a man who traveled over Thailand with an elephant. Netflix seems to be opening up internationally and this is a good example of something worth exploring.